A: You can use the web site to order or you can call us at 855-274-8664. Our web site is safe and secure using SSL encryption. We don't store credit card numbers on our system. A: Yes, we take all major credit cards or you can pay through PayPal. Q: How can I pay for this? A: Credit card or PayPal are the standard payments we accept. If you want to open an account and apply for credit, just give us a call and we will send you an application. We do offer terms to credit worthy companies and government agencies. Check or wire transfer/ach available in advance as well. Q: Do you carry the screws? Q: What type of screw should I use? A: Yes. We carry OEM quality screws with cutting threads. We currently offer both 2" and 2-1/2" lengths. Which screw size is right for me? What screw do I need for what size board? Q: Do I need to treat my floor? A: Certainly treating your floor with a high quality oil finish will extend the life of your floor and make it look great. Q: What do you recommend to treat it with? A: In the past, we recommended Messmer's UV Plus, Ipe Oil, Seal-Once, Penofin and Sikkens. 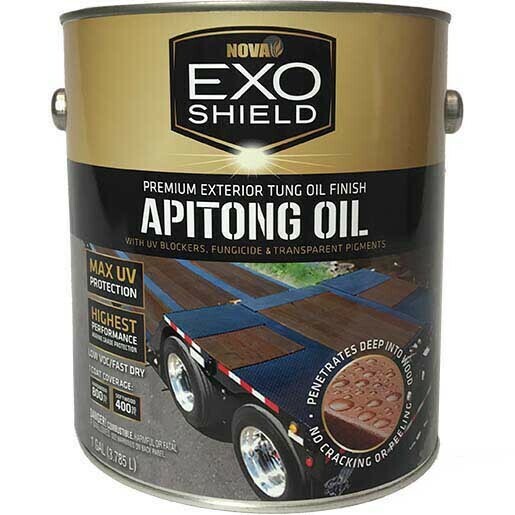 In 2018, TrailerDecking.com developed APITONG OIL - the finest quality exterior wood stain ever made. A proprietary blend of all Marine Grade components including Pure Tung Oil, Transoxide Pigments, UV Blockers and a Fungicide give our APITONG OIL the longest lasting protections available. Q: Do you sell the treatment? A: Yes. APITONG OIL is available from us. Coverage per gallon is 600 to 800 SF on smooth hardwood and 250 to 350 SF on rough hardwood. Q: What species of wood do you recommend? What species do you carry? A: Apitong is the best - practically all OEM's use for the toughest outdoor applications. We only offer the best - durable and dense, Apitong. A: Our offices are in Beaverton, OR - with warehouses in Memphis, Beaverton, Chicago & more. A: We are more than willing to offer Will Call pick up for our customers. It still takes us a day or two to pull an order so please allow for plenty of time. Occasionally, customers just show up at the warehouse - that won't work - you have to order well in advance. There is no shipping charge for Will Call orders. Q: How quickly can you ship? A: Provided we have the material in stock, 1-2 days is typical; but sometimes, we do get backed up. We will confirm expected ship date when you place your order. Q: What is transit time? A: 5 days to 10 days, depending on distance from warehouse. If you are located within a few hundred miles from one of our wareouses, shipping can be as fast as 3 days. Q: Can I request my lengths? A: Yes, absolutely - there is a text box you can use to enter your requested lengths when you order online. Or you can just call in and make a length request. Or, after you order online, just give us a call to pick lengths. Need to note lengths run between 8'-24' in foot long increments and stock will vary so check before ordering if requesting a length. Q: Do you cut to length? A: No. All of our material is full length at a minimum. Most pieces are 1" to 2" over in length. Q: Will you rip specific widths for starter or finish boards? A: No. We cannot rip boards for you. We suggest using a table saw with a good quality carbide tipped blade and a straight fence. A cabinet grade saw with a minimum 3 HP motor works great for anything up to 2" thick. If the fence is misaligned, the hardwood will bind up and burn while cutting - alignment of the fence is the key to ripping quickly without burning.